Looking for a way to soothe your newborn? Research shows that swaddling — a technique that mimics the coziness of the womb — can keep your baby warm and secure, as well as possibly calm a baby with colic. 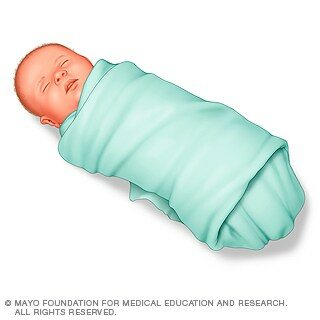 When swaddling isn't done properly, however, it can pose risks for your baby. To safely swaddle your baby, follow these tips. Colic. Merck Manual Professional Version. http://www.merckmanuals.com/professional/pediatrics/symptoms-in-infants-and-children/colic. Accessed Aug. 1, 2017. Clarke NM. Swaddling and hip dysplasia: An orthopaedic perspective. Archives of Disease in Childhood. 2014;99:5. McDonnell E, et al. Infant deaths and injuries associated with wearable blankets, swaddle wraps and swaddling. The Journal of Pediatrics. 2014;164:1152. Task Force on Sudden Infant Death Syndrome. SIDS and other sleep-related infant deaths: Updated 2016 recommendations for a safe infant sleeping environment. Pediatrics. 2016;138:e20162938. Developmental dislocation (dysplasia) of the hip (DDH). American Academy of Orthopaedic Surgeons. http://orthoinfo.aaos.org/topic.cfm?topic=a00347. Accessed Aug. 1, 2017.